تمثال الوحدة Statue of Unity)، هو تمثال للمقاتل الهندي من أجل الحرية ساردار ڤالاباي پاتل (1875-1950) في منطقة نارمادا بولاية گجرات، الهند. وهو أطول تمثال في العالم، حيث يصل طوله إلى 182 متر. كان ڤالاباي پاتل واحداً من أبرز قادة حركة استقلال الهند، وأول نائب لرئيس وزراء الهند. يقع التمثال على جزيرة نهرية مقابلة لسد نارمادا (الشهيرة بجزيرة سد ساردار ساروڤار) بالقرب من راجپيپلا، على بعد 100 كمن جنوب شرق مدينة ڤادودارا. يشغل التمثال والمنطقة المحيطة به أكثر من 20.000 م²، ومحاط ببحيرة صناعية مساحتها 12 كم². بنته شركة لارسن أند توبرو، التي حصلت على عقد قيمته 420 مليون دولار من أجل تصميم، بناء وصيانة التمثال في أكتوبر 2014. بدأ الانشاء في 21 أكتوبر 2014 وانتهى في منتصف أكتوبر 2018. التمثال من تصميم النحات الهندي رام ڤ. سوتار، وافتتحه رئيس الوزراء الهندي نارندرا مودي في 31 أكتوبر 2018، الموافق للذكرى 143 لميلاد پاتل. كان ڤالاباي پاتل واحداً من الآباء المؤسسين لجمهورية الهند. العدو من أجل الحرية في ديسمبر 2013. التمثال تحت الانشاء في يناير 2018. ^ Ashwani Sharma (1 November 2014). 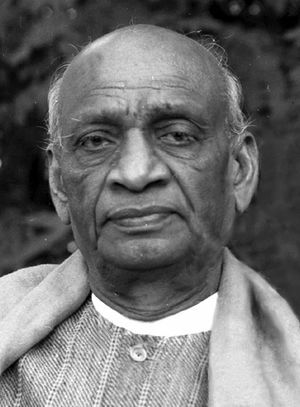 "14 Things You Did Not Know about Sardar Patel, the Man Who United India". Topyaps. Retrieved 16 May 2014. ^ "Gujarat: Statue of Unity expected to attract 10,000 tourists daily". ^ "All you need to know about Ram Vanji Sutar, sculptor behind the Statue of Unity, 50 other sculptures of politicians". firstpost.com. firstpost.com. Retrieved 31 October 2018. ^ "Ram Vanji Sutar: Meet the Noida Sculptor Who Pored Over 2,000 Photos to Design Statue of Unity". news18.com. news18.com. Retrieved 31 October 2018. ^ "PM Unveils Sardar Patel's 2,900-Crore Statue Of Unity Today: 10 Facts". msn.com. msn.com. Retrieved 31 October 2018. 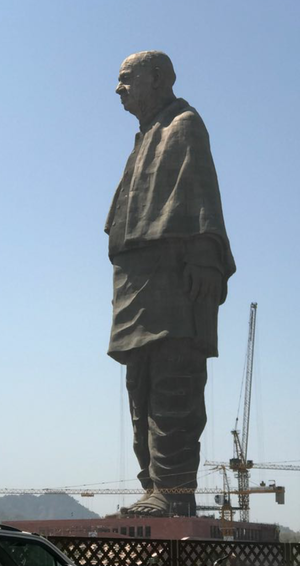 ^ "Sardar Vallabhbhai Patel's Statue Of Unity inaugurated by PM Modi in Gujarat's Kevadiya". economictimes.indiatimes.com. economictimes.indiatimes.com. Retrieved 31 October 2018. ^ "PM Modi inaugurates Statue of Unity: Why you should visit it this winter". indiatoday.in. indiatoday.in. Retrieved 31 October 2018. ^ "PM Modi unveils Statue of Unity on the banks of the Narmada". timesofindia.indiatimes.com. timesofindia.indiatimes.com. Retrieved 31 October 2018. ^ "For iron to build Sardar Patel statue, Modi goes to farmers". The Indian Express. 8 July 2013. Retrieved 30 October 2013. ^ "Statue of Unity: 36 new offices across India for collecting iron". The Times of India. TNN. 18 October 2013. Retrieved 30 October 2013. ^ Hiral Dave. "For iron to build Sardar Patel statue, Modi goes to farmers – Indian Express". archive.indianexpress.com (in الإنجليزية). ^ "The Indian Republic". The Indian Republic. ^ أ ب "Pan-India panel for Modi's unity show in iron". The New Indian Express. ^ "Statue of Unity: 36 new offices across India for collecting iron – The Times of India". The Times Of India. ^ "Farmers' iron not to be used for Sardar Patel statue". dna. 9 December 2013. 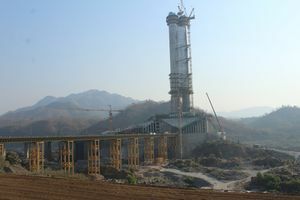 مشاع المعرفة فيه ميديا متعلقة بموضوع Statue of Unity.